BEVERLY HILLS, Calif. - July 24, 2018 - PRLog -- Sonnenblick-Eichner Company has arranged $50 million of interim first mortgage financing to refinance Hotel Theodore, a 20-story, 153-room, full-service, luxury boutique hotel located at the corner of 7th Avenue and Pine Street, in the heart of downtown Seattle, Washington, one block west of the Washington State Convention Center. The floating-rate loan was sized to a debt yield of less than 6% and priced over LIBOR at a spread in the mid-300s. Loan proceeds are being used to refinance the existing acquisition and renovation loan as well as provide a return of equity to the borrower, Portland, OR-based Provenance Hotels. In November of 2017, Provenance completed an extensive $32 million renovation that included updating the guestrooms, bathrooms, meeting rooms, public spaces, and a build-out of the ground floor restaurant space. Amenities include Rider, an upscale restaurant and bar, a coffee shop, approximately 4,172 square feet of state-of-the-art meeting space and a fitness center. "Given the excellent sponsorship and location, and that Seattle is one of the fastest growing and most dynamic gateway cities in the U.S., we had 14 competitive loan quotes from institutional lenders," said Sonnenblick-Eichner Company Principal Elliot Eichner. "The loan refinances an existing financing that was also arranged by Sonnenblick-Eichner Company," added Sonnenblick-Eichner Principal Patrick Brown. Sonnenblick-Eichner Company (http://www.sonneich.com) is a Beverly Hills-based real estate investment banking firm that specializes in arranging structured finance for acquisition, construction and permanent loans, interim and mezzanine financing as well as joint-venture equity transactions. The company is recognized for its expertise in marketing institutional real estate for sale and providing capital for all product types including retail, office, hospitality, industrial, and multifamily properties. Founded in 1985 and headquartered in Portland, Ore., Provenance Hotels is an owner and operator specializing in award-winning independent hotels with distinct and deeply integrated art. 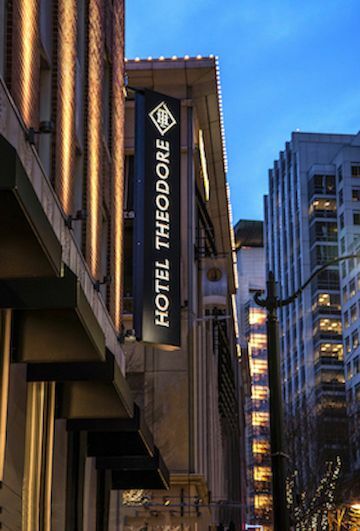 The portfolio includes Hotel deLuxe, Hotel Lucia, Sentinel, the Heathman Hotel and Dossier in Portland, Hotel Max and Hotel Theodore in Seattle, Hotel Murano in Tacoma, Wash., the Old No. 77 Hotel & Chandlery in New Orleans, Hotel Preston in Nashville and Lora in Stillwater, Minn. Provenance Hotels will open Woodlark in Portland in fall 2018. www.provenancehotels.com.